NFSB Continuing Education » Is there a future doctor in the house at NOVA… an animal doctor? Is there a future doctor in the house at NOVA… an animal doctor? Meet Jaimie-Lynn Leblanc-Ykema from Godmanchester (which is right beside the Trout River border crossing for those of you who haven’t heard of this fantastic place). 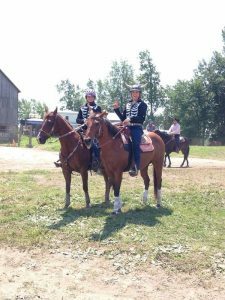 Jaimie travels to NOVA 5-days a week and is completing her Advanced Chemistry, Physics, and Math courses which are prerequisites for Veterinary college (The Saint-Hyacinthe campus of Universite de Montreal). Believe it or not, before Jaimie ever hits the road for her 1-hour drive to get to school, she’s already been up for hours helping to milk 70 cows and feed many calves. 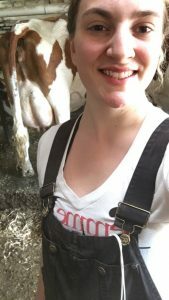 At 20 years of age, Jaimie was born into farming! Why does she want to become a vet? On her family farm, she has had many opportunities to work alongside vets. She’s even assisted with C-sections in cows and bovine uterine prolapses (look these up if you want to see some incredible images). Jaimie has also just completed her Diploma in Farm Management and Technology at the MacDonald College campus of McGill University and has recently been accepted to Concordia University into their Science Foundations diploma program. With all this going, Jaimie still finds time to have some fun. She competes in Horse Barrel racing and Enduro Motocross! She is also part of SCA… the Society for Creative Anachronism which is an international non-profit volunteer educational organization devoted to the research and re-creation of pre-seventeenth century skills. These pre-seventeenth century skills include arts, combat, culture, and employ knowledge of history to enrich the lives of participants through events, demonstrations, and educational presentations and activities. Check out the pic of Jaimie on horseback sporting pretty cool looking Bull horns! We’re pretty impressed! We are all so impressed with your hard work and dedication! Keep up the excellent work! Great work Jaimie ! The most dedicated and hard working individuals will always succeed in their goals. Stay on track and before you know it you’ll be where you want to be. Amazing how you can do all that and still keep up with your studies. Keep up the good work. Congratulations Jaimie, you’re such a strong woman i ever meet in my life. You go Jaimie!!! So proud of your dedication ! It’s astounding to hear about the stories of some of the students attending Nova. Jaimie-Lynn’s story is incredibly inspiring. Its always cool to learn about the huge amount of stuff people get done in their spare time, and I doubt she’s the only one here at Nova!